perhapablog... and other ramblings: casper and the spectrals and leanne hannah! just got this really nice review from george marston over at newsarama---! 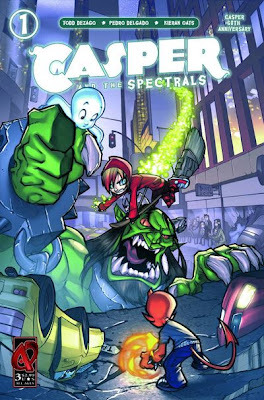 Casper and the Spectrals #3 (Published by Ardden Entertainment; Review by George Marston): Casper the Friendly Ghost may be just about the last character you'd expect to find facing off against demons in an action/adventure comic. Just hearing that premise conjures the image of a direct to DVD movie done in bad CGI, or a mid-nineties "CASPER EXXXTREME" type of comic. Here's the thing; it's actually not that bad. Sure, the idea of Casper, Wendy the Witch, and Hot Stuff getting into scrapes with powerful evil forces is still a little jarring, but really, what actually goes on isn't much of a stretch. The three friends find themselves face to face with an evil spirit, freed from his ancient prison, and trying to take over the realm of magic. They end up overcoming this obstacle with, naturally, teamwork and the power of friendship. Todd Dezago is hardly a newcomer to comics, and he nails the tone, and Leanne Hannah and Kieran Oats turn in some charming art. All in all, this may not quite be the kind of trouble Casper used to get in, but this is a pretty decent kids comic with the same positive vibes that the classic Harvey characters used to throw around. but one thing that i definitely did NOT want to let slip away was a chance to celebrate our own LEANNE HANNAH on the phenomenal job she did with the artwork here! it is just fantastic! i mean, we KNOW that leanne is talented--she's certainly revealed that here on the perhapanauts, on the i-wish-they-would-make more cult sensation Lava-Roid, and, of course, over on bluemilkspecial.com where she and rod provide us with constant laughs at the empire's expense! but leanne was called in at the bottom of the ninth on this one, coming in to bat clean up following the departure of pedro delgado...and, man, she knocked it outta the park! see, leanne was faced not only with the task of finishing the story, she had to also be aware of the transition from one artist to the next, a shift that can, as history will attest, be incredibly (and sometimes subtly) jarring to the reader. if the change in style or storytelling is drastically obvious, it can ruin the entire story--the entire experience--never to be restored. leanne was not only attentive to that fact, but worked to maintain the tagger-type style that pedro has while gradually introducing her own. in doing so, she was able to bring so much more emotional power to the climax and resolution of the three-issue journey that i was concerned might be difficult to convey. so here's to our leanne! thank you, sweetie, for doing such a wonderful--and thoughtful--job! go get a copy and see for yourselves! I too was surprised to see Issue 3 of Caper and the Spectrals on the stand last week, but not surprised by the great art from Perhapa-Pal Leanne Hannah. Now that I hear you talk about how last minute the assignment was, I am even more impressed. Picked mine up last week. Great job, Todd. And hooray for Leanne for saving the day! Thanks, Todd! You are far too kind! But I had a blast working on the book (as you know!) and I hope it comes through in the art. It was great working with you! We'll have to do it again sometime soon, yes?